What’s the first thing that comes to mind when you think of the month of May? Balmy breezes? Sweet-smelling flowers? How about root canal treatment? 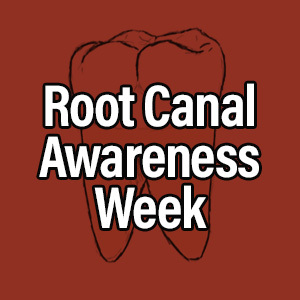 The last item might seem out of place…but for the last ten years, Root Canal Awareness week has been celebrated in May. So let’s take a closer look at this important—and often misunderstood—dental procedure. What we commonly call a “root canal” is a special treatment that can save diseased teeth which might otherwise be lost. But the root canal itself is actually a set of hollow, branching passages deep inside the hard outer tissue of the tooth. The tiny “canals” contain the tooth’s soft pulp, including nerves, blood vessels and connective tissue. These tissues help teeth grow during childhood but aren’t necessary in healthy adult teeth—and, what’s worse, they can become infected via deep cavity or a crack in the tooth’s outer layers. When bacteria infect the pulp tissue, the inflammation often causes intense discomfort. In time, the harmful microorganisms can also pass through the tooth’s root and into the tissue of the jaw, resulting in a painful abscess. Eventually, if it isn’t treated, the tooth will likely be lost. Root canal treatment is designed to remove the infection, relieve the pain…and save the tooth. It is usually performed under anesthesia for your comfort. To begin the procedure, a small hole is made in the tooth’s enamel to give access to the pulp; then, tiny instruments are used to remove the diseased tissue and disinfect the tooth. Finally, it is sealed up against re-infection. Following treatment, a cap (or crown) is often needed to restore the tooth’s full function and appearance. Despite some rumors you may have heard, root canal treatment is neither very painful nor likely to cause other health problems. So if you come across these discredited ideas, remember that dentists and dental specialists called endodontists perform some 25 million root canal procedures every year—and this treatment method has been validated for decades. Of course, like any medical procedure, root canal treatment is not 100% successful. While the procedure has a very high success rate, it’s possible that additional treatments will be needed in some cases. However, the alternative—extracting the tooth—has similar potential downsides; plus a replacement tooth will be needed to avoid the health and lifestyle troubles caused by missing teeth. But one thing is certain: Ignoring disease in the tooth’s soft tissues isn’t a good move, because the infection won’t go away on its own—and down the road it will only get worse.